The lab itself owed its existence to and was centered around the end of things — the decline of the era in which anyone aside from an ever-smaller fraction of filmmakers could count on even making the costs of a feature back the conventional way, through an all-rights sale to a distributor. There are more and more films being made every year — 50,000 globally was the number being thrown about — and there’s more and more competition for viewer attention from television, games, the internet and beyond. Companies no longer have the need nor the ability to spend the equivalent amount on features. If independent film is going to have a chance to be something other than a hobby, if filmmakers are going to be able to have, if not millions of dollars, at least the hope of a sustainable career pursuing their passion, then something has to change. 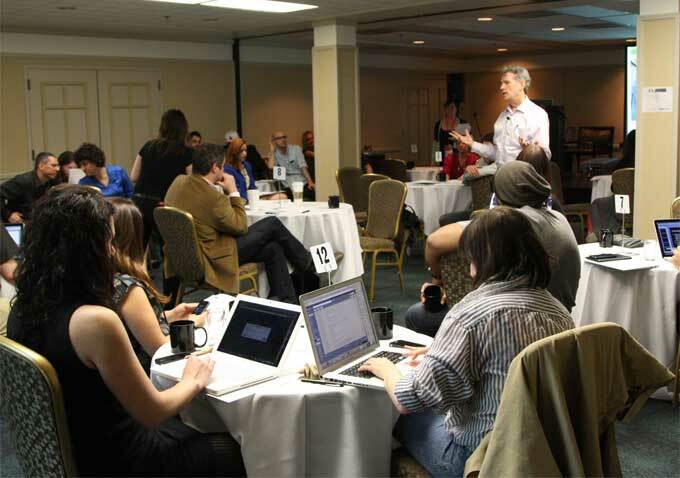 With that spirit in mind, the labs were devised to be as practical an event as possible, with the 12 invited projects in various stages of production scheduled to leave on May 5 with an actionable strategy in place, should they choose to use it, for how to fully or partially direct distribute their films. 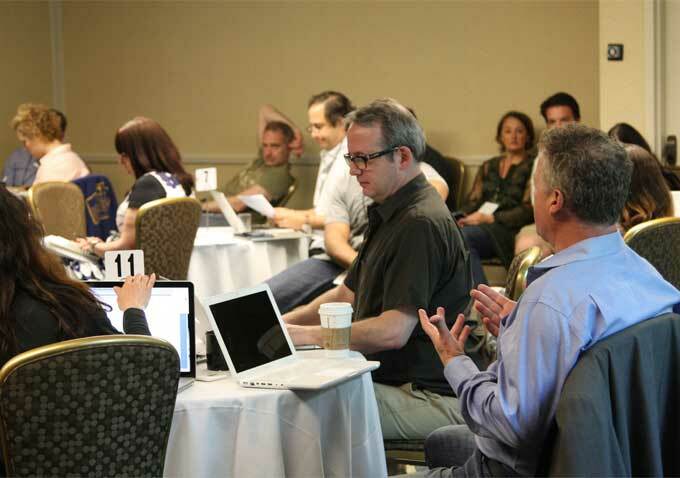 As is fitting for the Bay Area, much of the language thrown around during four days densely packed with meetings and presentations was borrowed from Silicon Valley, and most of the techniques discussed revolved around how technology now allows filmmakers direct communication with their audience. Hope spoke of “rapid prototyping” and “emerging markets,” “infrastructure” and “multiple iterations,” while elsewhere the keyword was that current favorite of the tech industry, “disruptive.” And looking at the numbers in the current market, creators are sorely in need of disruption — among the 17 hard truths Hope provided in his three-part opening day talk was the fact that “artists and their supporters are rarely the primary financial beneficiaries of their work,” something that retaining their rights could potentially change. Between presentations from Cinedigm’s Erick Opeka (who tackled the changes in the home entertainment biz over the past decade), “The Perfect Family” producer Cora Olson (who offered a detailed case study of how they released the film themselves), Kickstarter’s Elisabeth Holm (who looked at why certain recent film campaigns were successful), “The Canyons” producer Braxton Pope (who talked about leveraging director Paul Schrader and writer Bret Easton Ellis for crowdfunding and how the Kickstarter campaign also served a promotional function) and others, the filmmakers and their assigned advisors met with different direct distribution partners in speed dating-style short meetings. Cinedigm, Deliver Your Audience, Gravitas, Fandor, IndieFlix, Kickstarter, Kinonation, Indiewire’s parent company SnagFilms, TopSpin, Tugg and VHX were present, as was presenting sponsor Vimeo, whose recently launched Vimeo On Demand service has offered a possibly major outlet for filmmakers looking to monetize their work. Documentaries are leading the way in direct distribution and community building. Though all the projects in the lab were narrative films, when Paradigm Consulting’s Peter Broderick offered up successful direct distribution case studies in his talk, the examples were mainly nonfiction — a doc on raw food that sold thousands of copies after offering up the film for free streaming for a week, another on Estonian music that featured CDs for purchase on their website alongside their DVD. A presenter from communications strategists Active Voice spoke about how nonprofits have become very savvy about films reaching out to their communities, a now familiar doc strategy, but that there’s still untapped potential for narratives to be able to do this with their capacity to reach a new and broader audience. Filmmakers need to look outside the film world. Hope described the film world as siloed, with tendencies toward isolation from other mediums and communities and, because of it, a certain limited way of thinking about the industry’s problems — something he was actively trying to remedy by bringing film together with the tech world. Broderick cited Amanda Palmer’s million dollar Kickstarter campaign as one from which filmmakers could learn in the way she phrased her appeal for funding and how she continues to engage with her fans. Filmmaker Adam Collis, who was one of the 12 participants as well as a speaker, followed up his first feature in 2000 by getting an M.B.A., and delved into the business side of direct distribution as something that would shift the potential for reward for a film’s success away from a distributor to the financiers already bearing up most of the risk. Filmmakers also need to start planning and budgeting for distribution alongside production. Films will still be snapped up at Sundance and given traditional theatrical releases, but for most others, direct distribution is a reality that needs to be considered alongside production costs and strategy from the outset. Olson mentioned consulting with publicists before the casting process now, to understand the impact pursuing someone for their recognizability will actually have, while Pope noted that PR is just a 20th the cost of marketing and often more effective. Broderick stressed that these costs needed to be considered earlier in the process, and that a filmmaker shouldn’t feel the need to have to do everything him or herself, but should be ready to bring on partners who are experts at the roles being delegated — even if that comes down to something as simple as the aforementioned Amanda Palmer hiring someone to manage her Facebook page. Direct distribution is all about practicality. Just as indie filmmakers have learned to keep to tight budgets and come up with their own solutions for problems that arise during production, the distribution process is going to be a patchwork of partnerships and pragmatic decisions. In the one-on-one meetings, filmmakers were asked about whether they really needed a theatrical release and how much of one that would be, and were requested to think realistically about the audience for their work and how to reach those potential viewers. Olson spoke of realizing that “The Perfect Family” skewed older and softer than the films that usually performed well on the festival circuit, and that it might be better suited to Lifetime, who eventually bought it. Broderick noted that all docs should have a 52-minute cut ready for the all-important TV sales. Opeka pointed out that with the rise of streaming and our journey toward everything being available all the time, digital rentals are outpacing sales. Rather than looking for a lump sum, the future of monetizing filmmaking is going to be all about the accruing of these smaller payments. Filmmakers should think about themselves as the brand rather than a single film. Hope brought up the shift in the music industry from albums to singles, pointing out that many artists are releasing their output in a more steady flow rather than always saving it up to be put out in chunks dictated by older technology. Filmmaking doesn’t quite work the same way, though Hope called out the documentary short as ideally suited to the digital age. But the most common recurring theme for A2E was that filmmakers need to build up and have a way of reaching out to their fanbases, via social media, a mailing list or beyond, and that they should engage with these followers in ways that are more continuous and that aren’t just about asking for funds for a new project or announcing their film’s latest festival acceptance. As Kickstarter’s Holm put it, crowdfunding is the “intersection of patronage and commerce,” and people don’t perceive it as charity: “Having an engaged audience doesn’t mean that they want nothing in exchange.” It’s important for filmmakers to maintain communication with their community. 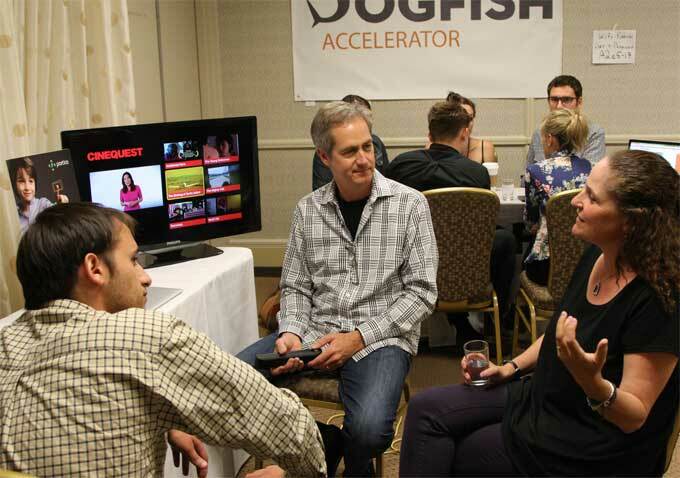 Outside of OnRamp, the main A2E lab, the festival also offered LaunchPad, a two-day forum in which film and media entrepreneurs presented their companies to the lab’s participants. 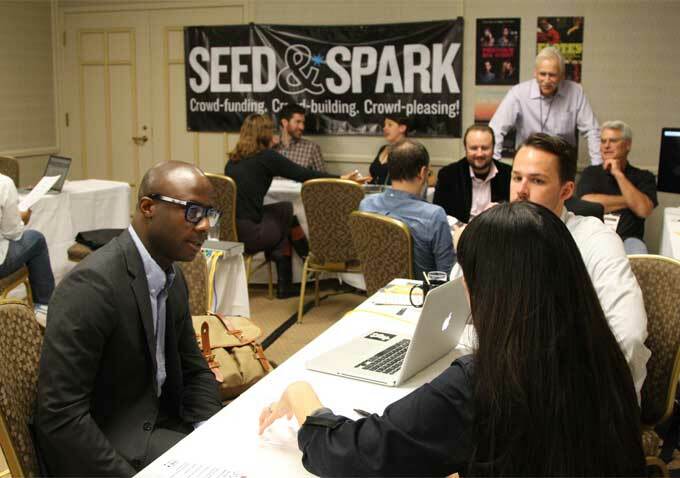 Crowdfunding sites like Rally and Seed & Spark, streaming platforms like Epoch and Elevison and innovative accelerators and production companies like Dogfish and JuntoBox offered up intriguing new possibilities for finding funding and getting movies out to the world. 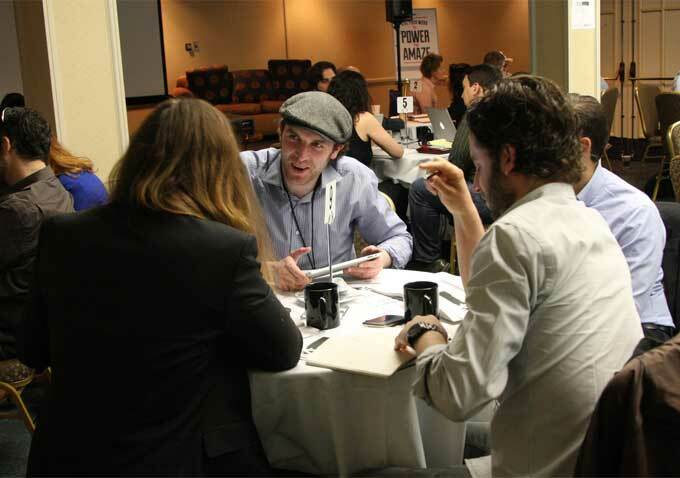 But for the participating filmmakers, one of the major benefits of A2E was just knowing that they weren’t alone on the road toward self-distribution, that it was starting to make more sense both for other directors and producers and for these new businesses springing up, and to talk tangible details. “You get the feeling you are on the verge of something so new and so powerful,” said “Detroit Unleaded” writer/producer/director Rola Nashef. “It can be such a closed little world, and it’s really hard to get numbers and real, practical advice. It worked together so well. You don’t feel so alienated.” She pointed out something that UTA’s Bec Smith had mentioned in her presentation — that what a lot of filmmakers really want is the industry to endorse them, a mindset that’s no longer necessary. “You’re not feeling like you’re in a room, alone, and there’s this industry out there that has teeth,” agreed “Pit Stop” producer Jonathan Duffy. He said that for the next film he works on, he’s going to consider all of the partners he met at the lab from the beginning and discuss what they offer with his investors. For others, the information presented changed their approach to their current project. “I had an idea about what I wanted to do with the film before I got here,” said Tommy Oliver, the writer, director, producer and editor of “1982.” “Being here, it really jogged some stuff, and now I’ve got a very different idea — something that hasn’t been done before in film.” What that idea is, he wouldn’t say, but as with all of the A2E projects, what happens next is going to be the really interesting part.